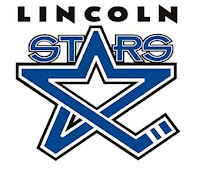 Lost in the excitement of last Tuesday's Futures Draft, and Wednesday's Entry Draft, was the news that the Lincoln Stars acquired forward Luke Voltin and defenseman Luke Shiplo from Des Moines, and defenseman Jared Kolquist from Sioux City. I will post the particulars of each trade below. Lincoln traded their first pick in the 2013 USHL Futures Draft to the Des Moines Bucaneers for the rights to Voltin, Shiplo, and Des Moines' 6th round pick in the Futures Draft. In my opinion, this a great acquisition by Lincoln. The Stars get two, young USHL vets for swapping their first round futures pick for Des Moines' sixth round pick. Great return. Jared Kolquist was acquired from the Sioux City Musketeers for Lincoln's 4th round pick in the 2014 USHL Entry Draft. Another good acquisition in my opinion to get a seasoned USHL defenseman for a draft pick. Voltin ('95), who is originally from Blaine, MN, played 60 games for the Bucs last season and scored 26 points (7g, 19a). In those 60 games, Luke was -17 and added 50 PIM's. The year before, Voltin started the 2011-12 season with Team USA U17 and scored 6 points in 11 games with them before he was dismissed by the NTDP in January of 2012. His USHL rights were originally acquired by the Chicago Steel after his dismissal from the NTDP, but the Steel traded Voltin to the Des Moines Bucs shortly after. Luke has committed to the University of North Dakota for 2014, so he will play one season for the Lincoln Stars. Shiplo ('95), who hails from Oakville, Ontario, Canada, scored 10 points (3g, 7a) in 46 games for the Des Moines Bucs last season along and was -12 with 33 PIM's. Luke has committed to Western Michigan University for 2014, so like Voltin, he will play one season for the Stars. Because he was born in Canada, and has only played one year of hockey in the USA, Shiplo is considered an "import" in the eyes of the USHL. Every USHL club can roster only four imports each season. Former Stars defenseman Matt Prapavessis, and his younger brother Michael (who is a Stars affiliate defenseman), is also from Oakville, Ontario. Kolquist ('93) played 57 games for the Muskies last season and scored 27 points (6g, 21a), was -3, and accumulated 42 PIM's. Since he was born in 1993, Kolquist is an "overager" in the eyes of the USHL for the 2013-14 season. Each USHL team can roster only four overagers each season. The Stars don't have any players returning from last season who were born in 1993, so Kolquist could be one of Lincoln's four overagers next season. In the 2012 USHL Entry Draft, Kolquist was drafted in the fifth round by the Sioux City Musketeers after completing his high school career at Hermantown High School in Hermantown, MN (his hometown). In 31 games for Hermantown in 2011-12, Kolquist scored 41 points (14g, 27a) and added 38 PIM's. As far as I know, Kolquist has not committed to a college yet. I really hope to see all three players noted above at Lincoln's tryout camp next month in Minneapolis. Note: This is unrelated to the above info, but Lincoln Stars assistant coach Josh Berge was recently named head coach of the Valencia Flyers of the Western States Hockey League. Josh played 31 games for the Stars between 2009-11 before his playing career was unfortunately cut short due to concussions. Berge became a full-time assistant for the Stars at the beginning of the 2012-13 season. Best of luck to Josh in sunny California! Hope to see him back in Lincoln someday behind the Stars' bench.